Primary hepatolithiasis (PHL) is endemic in East Asia and is much less common in Western countries, where, however, it is becoming increasingly recognized. Although the etiology remains not fully understood, in Western countries PHL is strictly related to congenital bile duct strictures and dilatations. Biliary pain represents the most frequent initial symptom but cholangitis is common in patients with a long history of previous surgical or nonsurgical treatments. PHL is more frequently located in the left hemiliver, but right bile ducts and bilateral location are not unfrequent. Complications of PHL include recurrent cholangitis, liver abscesses, pyogenic sepsis, parenchymal atrophy, persistent liver dysfunction resulting in secondary biliary cirrhosis, and cholangiocarcinoma. 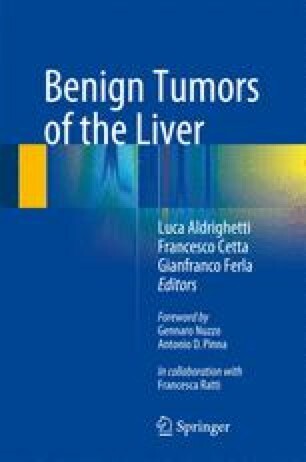 In PHL limited to one hemiliver (sector or segment), liver resection represents the only treatment which can allow to remove intrahepatic stones together with affected bile ducts and significantly reduces the risk of cholangiocarcinoma. 2–10 % of patients with hepatolithiasis develop an intrahepatic cholangiocarcinoma, which is usually difficult to diagnose preoperatively in these patients. Morbidity after liver resection is frequently characterized by septic complications, mainly in patients with preoperative recurrent cholangitis and previous endoscopic or percutaneous treatments. Percutaneous and endoscopic procedures for treatment of PHL are widely reported in the literature with good results, but high stone recurrence rates, frequent recurrent cholangitis, and the risk of cholangiocarcinoma should be carefully evaluated.